The certified fuel efficient powerful engine meets Tier III emissions regulations granting reduced fuel consumption. A large fuel tank, combined with low consumption, results in not more than a 2-day work period between refills. The Extended Maintenance System grants longer greasing intervals on all pins compared to competition. All filters and regular fill points are grouped for easy access. Radiator and cooler cores are mounted side by side for more efficient cooling and easy access for cleaning. Optional high flow refueling pump with automatic cut off reduces downtime for regular fills. The widen cab structure offers more leg and foot space, while the extensive glass surface contributes to give an impression of aperture to the operator. Ergonomic layout, intuitive controls and a seat that lays flat ensures optimum comfort for all operators. Additionally, the viscous fluid cab mountings and top quality insulation lead to a stress and fatigue reduction for the operator, boosting productivity and performance. Four positions consoles with return to pre-set modes will suit operators of all sizes and needs. All round visibility in the cab is provided by a wide glazed area with single-piece window on the right hand side for unobstructed view. The frame structure has three times the structural rigidity of previous models, reducing noise and vibration for the operator. An adjustable control console with ergonomic design makes it easier to choose the correct operating mode, increasing comfort and safety. 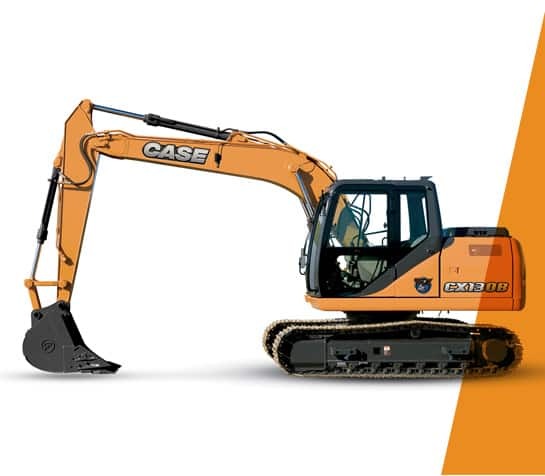 Discover CASE Crawler Excavators of our customer, Baredo Construction . CASE assisted Philippines communities when typhoons, floods, quakes occured in the past. Baredo Construction chosen CASE to help its customers to improve their business, their lives and to all progess forward.